The 1993 American Silver Eagle Coins showed significant improvement in their bullion strike numbers but also returned a decline in the Proof Eagle mintage. Bullion increases were likely the result of the silver market showing its first real increase in several years. After bottoming out the year before at an annual average of $3.95 an ounce, 1993 came in at $4.31 an ounce. 1993 would also mark the first year in which the US Mint struck the Proof Silver Eagles at its facility in Philadelphia. Previous to this year, all of the Silver Eagles were struck at the US Mint’s facility in San Francisco. Bullion Eagles would continue to be struck in California for several more years. A proof Silver Eagle was included in a special "Philadelphia Set" marking the bicentennial of the first striking of US coinage in Philadelphia in 1793. Also included in the set were three sizes of the Proof Gold Eagles as well as a silver proof US Mint Bicentennial Medal. Bullion Eagle sales showed a large increase for the year coming in at 6,763,762, a jump of 1,223,694 coins, or up 22%. This would represent the highest mintage the bullion Eagle’s would see for the next five years. Proof Silver Eagles dropped to 405,913, the second year in which the proofs showed a decline. In fact, the 1993 mintage would remain as the second lowest annual mintage in the coin’s first quarter century of availability. The 1993 Silver Eagles mark the eighth year in which the Silver Eagles were produced by the US Mint. The US Mint had the 1993 Eagles available for most of the year. Proof Silver Eagles were available directly from the US Mint for $23 each. 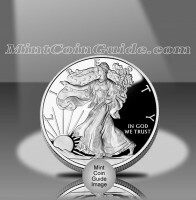 The Mint’s network of authorized purchasers sold the bullion Eagles to the public for a small premium above the spot price of the silver contained within them. The Bullion Silver Eagle was still produced at the US Mint’s facility in San Francisco, but did not contain any mintmark. The Proof Silver Eagle was struck at the US Mint’s facility in Philadelphia and had the ‘P’ mintmark. "Walking Liberty" is featured on the obverse (heads side) of the American Silver Eagle. It was originally designed by Adolph A. Weinman and first appeared on the 1916-1947 half dollar. John Mercanti designed the reverse (tails side) to shows a heraldic eagle.